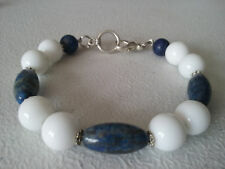 HANDMADE SILVER PLATED BLUE LAPIS BRACELET 8"
HANDMADE SILVER PLATED BLUE LAPIS AND WHITE AGATE BRACELET 7 1/2"
MULTI GEMSTONE FOR CHRISTMAS EVE HANDMADE JEWELRY GEMSTONE JEWELRY BRACELET 7-8"
I see my wire is overlaid so it adjusts comfortably for 8 plus wrists. Charms, Pendants, Chains, etc may be plated over pewter, mixed alloy or solid copper. And I highlighted with 9-8mm denim blue AB faceted rondelle crystals for the girl in you! All charms are silver plated/tone. 1-2-sided ‘lucky‘ feather. 2-4-leaf ‘lucky‘ clover. 2-‘lucky’ Horseshoe. Charms, Pendants, Chains, etc may be plated over pewter, mixed alloy or solid copper. This mid size 7 3/4 inch Chunky Bracelet with Heated Citrine Gemstone Nuggets is a Chunky Statement piece. The nearly 1 inch Glass Crystal has been dubbed a "Mystic Crystal" with a beautiful multiple colors that play in a mesmerizing pattern. Constantly changing, real Statement piece! Handmade in the USA! Hot pinkagate beads with a central rose patterned lampwork glass bead. 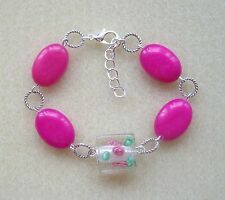 Pink BeadBracelet. Length approx. 6.5" 1" extension chain. 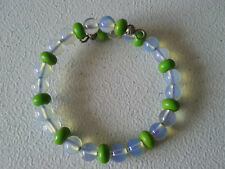 ~ Supplied in a pretty organza gift bag ~. New ~ Handmade. before 1pm. 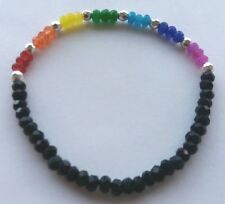 GEMSTONE STRETCH CHAKRA BRACELET. RED JASPER. YELLOW JADE. GREEN JASPER. 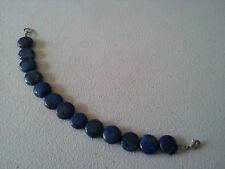 BLUE JASPER.